Here we present a protocol for characterizing monocyte subsets by whole blood flow cytometry. This includes outlining how to gate the subsets and assess their expression of surface markers and giving an example of the assessment of the expression of M1 (inflammatory) and M2 markers (anti-inflammatory). Marimuthu, R., Francis, H., Dervish, S., Li, S. C., Medbury, H., Williams, H. Characterization of Human Monocyte Subsets by Whole Blood Flow Cytometry Analysis. J. Vis. Exp. (140), e57941, doi:10.3791/57941 (2018). Monocytes are key contributors in various inflammatory disorders and alterations to these cells, including their subset proportions and functions, can have pathological significance. An ideal method for examining alterations to monocytes is whole blood flow cytometry as the minimal handling of samples by this method limits artifactual cell activation. However, many different approaches are taken to gate the monocyte subsets leading to inconsistent identification of the subsets between studies. Here we demonstrate a method using whole blood flow cytometry to identify and characterize human monocyte subsets (classical, intermediate, and non-classical). We outline how to prepare the blood samples for flow cytometry, gate the subsets (ensure contaminating cells have been removed), and determine monocyte subset expression of surface markers — in this example M1 and M2 markers. This protocol can be extended to other studies that require a standard gating method for assessing monocyte subset proportions and monocyte subset expression of other functional markers. Monocytes are a type of white blood cells which play a major role in promoting and resolving inflammation. There are three main subsets of monocytes recognized, classical (~85%), intermediate (~5%), and non-classical (~10%) monocytes, which are characterized by their level of cluster of differentiation (CD)14 and CD16 expression1. The proportions of monocyte subsets can differ with the presence of disease, such as an increased proportion of intermediates in various inflammatory states2,3 including cardiovascular disease, where the level of intermediates is associated with clinical events4,5. Furthermore, in disease conditions, monocytes can also undergo functional changes, with many changes detectable by a difference in surface marker expression6,7. One such example is monocyte M1-skewing, an increase in markers associated with M1 macrophages, which has been observed in cardiovascular disease, diabetes, obesity, and metabolic syndrome7,8,9,10. Despite the popularity of flow cytometry to assess monocyte subset proportion and function, there is a considerable variability in sample preparation and subset gating between studies which makes it difficult to compare findings between such studies. Importantly, there is no consensus in the demarcation of monocyte subsets, yet a standardized approach is essential given the clinical significance of changes in subset proportions in several diseases. Part of the difficulty in gating arises from the fact that monocytes differentiate from the classical through the intermediate to the non-classical subset11 and as such, monocytes exist as a continuous spectrum rather than distinct populations12. Interestingly, Zawada et al. showed that using either a rectangular or trapezoid gating of the intermediate subset, both resulted in a higher intermediate subset that predicted a cardiovascular endpoint13. This highlights that, at least for calculating proportions, the key issue is applying a consistent gating strategy between different samples (and studies), rather than attempting to definitively discriminate between subsets. While definitive gating may be more important when assessing function, the change in marker expression between subsets is incremental12,14, and thus again, consistency in gating is perhaps key. As such, an objective gating method that reproducibly apportions the monocyte subsets between different samples is needed. The purpose of the method presented here is to gate monocyte subsets with a clear explanation and justification for the gating technique employed and assess the subsets for surface marker expression, thus providing a method which allows researchers to have confidence in the use of this technique when assessing different samples. This study has been approved by the WSLHD Human Research Ethics committee (HREC) (approval AU RED HREC/15/WMEAD/289). NOTE: As human blood is potentially infectious, the sample set-up should be performed in a biohazard hood. Collect the blood samples from the participants into 3 mL ethylene diamine tetra acetic acid (EDTA) tubes. Determine the white blood cell (WBC) count using a hematology analyzer or hemocytometer. Dilute with phosphate buffered saline (PBS) (pH ~7.4) to adjust the concentration to ~5 x 106 WBC/mL. Prepare sufficient master mix for the number of tubes (e.g., for 14 tubes, prepare 16x master mix) by combining 16x volumes of 50 µL blood, 0.75 µL anti CD14-V450, 0.5 µL anti CD16-APC, and 0.625 µL anti HLA-DR-PerCP. Vortex and pipette 51.9 µL of mix into each tube (Table 1). NOTE: Antibodies should be titrated to determine optimal staining concentrations for the fluorescent antibodies used. Add surface marker (M1 and M2 or isotype control, phycoerythrin (PE) labelled) antibodies (example as per Table 2) and PE labelled markers for T cells (CD3), B cells (CD19), neutrophils (CD66b), and natural killer (NK) cells (CD56) (Table 3). Vortex and incubate for 30 min, 4 °C in the dark. NOTE: Markers for lymphocytes, neutrophils, and NK cells are included only for the validation of the gating method. Add 250 µL of combined red blood cell lysis/WBC fixing solution, vortex gently immediately, and incubate for 10 min in the dark at 4 °C. Add 250 µL of PBS and spin cells down at 260 x g for 10 min at room temperature. Remove supernatant, re-suspend cells in 300 µL of 1% formaldehyde. NOTE: Formaldehyde is toxic. Use nitrile gloves and use in fume hood. Store at 4 °C protected from light until analysis is performed. NOTE: Flow analysis is recommended to be done within 48 h of sample preparation. Check flow cytometer log to ensure facility staff have performed quality control checks. NOTE: To ensure consistency between analyses, instrument quality control and maintaining consistent target fluorescence intensities using control beads are recommended. To set up the flow cytometry experiment, click on “New experiment then “new specimen” and “new tube” to add tubes. Select bivariate plots by clicking on the icon and use the dropdown menus to select the axis parameters. Ensure inclusion of a CD16/CD14 plot and a plot displaying a detector alongside time to monitor the acquisition. Insert tube and click “Acquire”. Check the instrument voltage settings ensuring that detector signals are not off scale. Observe cells falling in the monocyte gate of the CD14/CD16 plot. Set recording threshold to 5,000 events for the classical monocyte gate and click on “Record”. Continue to record data for remaining tubes. After data for all tubes has been recorded, export flow data as .fcs files for analysis. NOTE: To ensure accuracy, single color compensation controls should be recorded. A compensation matrix can be calculated and applied to the data before analysis to account for spectral spill over15,16. Open files in the analysis software. Double click tube name and select parameters from the dropdown menus to visualize the cells on a forward scatter area FSC(A)/forward scatter height FSC(H) plot. Create a doublet exclusion gate by clicking on the polygon gate tool icon and enclosing the cells as in (Figure 1A). Select the gated cells (by double clicking on the gated region) and in the new display box adjust dropdown menu parameters to display the cells on an FSC(A)/side scatter SSC(A) plot. Click on the rectangular gate icon and generously select the monocyte population based on forward and side scatter properties to exclude the majority of lymphocytes, NK cells, and granulocytes (Figure 1B). Select the gated cells and redisplay on a CD14/CD16 plot, selecting the parameters by using the dropdown menus. Click on the polygon gate to select monocytes based on their characteristic “┐” shape (Figure 1C). Select the gated cells and display the monocytes on a CD16/HLA-DR plot by using the dropdown menus to select parameters. Click on the polygon gate to select the HLA-DR positive cells and exclude any remaining NK cells and neutrophils17 (Figure 1D). Select the gated cells and display the HLA-DR positive cells on a CD14/HLA-DR plot using dropdown menus to select parameters. Click on the polygon gate and draw a gate to exclude the HLA-DR high/CD14 low cells (B cells express high levels of HLA-DR but not CD14) (Figure 1E). NOTE: B cell contamination may occur and therefore should be investigated. If the non-classical population in Figure 1C is not distinct from the cells to its left, then contamination is likely. Step 3.5 can be skipped if B cells are not overlapping with non-classical monocytes. Select the gated cells and use dropdown menus to display them on a CD16/CD14 plot. From plot options select “Zebra plot” which will enable monocyte subset gates to be drawn to determine subset proportions (Figure 1F). NOTE: If zebra plot is unavailable on the analysis software, pseudo color (smooth) or contour plot may be suitable. Click on the rectangular gate icon and select the classical monocytes by drawing an approximate rectangular gate around the CD14 high/CD16 low, classical monocyte population. Under “Display” select “Show medians” to display the median fluorescence intensity for classical monocytes. Adjust the gate such that the population has an equal distribution from the median on the left and right encompassing all the cells to the left. Select the intermediate population by drawing a rectangular gate that encompasses the cells to the right of the classical gate. Adjust the bottom of the gate to exclude the non-classical cells by aligning the gate with the bottom of the concentric circles that are completely within the classical monocyte gate, which ensures that the intermediate subset has a CD14 expression comparable to the main classical population consistent with the current nomenclature. Gate the non-classical subset by drawing a rectangular box down from the lower edge of the intermediate subset, selecting all the cells to the bottom of the population (Figure 1F). Under “Display” select “Show gate frequencies” to determine the percentage of each monocyte subset. To determine whether potentially contaminating cell types are effectively gated-out, first identify different cell populations with antibodies against T cells (CD3), B cells (CD19), neutrophils (CD66b), and NK cells (CD56) (Figure 2). NOTE: Here T cells and neutrophils do not sit close to the “┐” shape of monocytes and are gated out in Figure 1C. Confirm that NK cells are removed in step 3.4 (Figure 1D), and B cells are removed in step 3.5 (Figure 1E) as shown in Figure 3. If NK cells or B cells are not gated-out, re-adjust the gates. Select cells from each monocyte subset. Alter dropdown parameters to create a histogram for each monocyte subset (Figure 1F) displaying each marker and its matching isotype (Figure 4). Calculate the degree of expression of each marker (median or geometric mean) compared to the respective isotype control. The monocyte gating strategy and flow cytometry analysis used here (Figure 1) successfully gated the monocyte subsets and revealed their relative proportions. The proportions (for this sample) were calculated as 88.1% classicals, 4.33% intermediates, and 7.49% non-classicals. These subset gates were not contaminated with B cells, T cells, neutrophils or NK cells, which was confirmed with markers CD19, CD3, CD56, and CD66b, respectively. By assessing the relative position of other populations, it is clear that the T cells and neutrophils fall well outside the monocyte "┐" shape on a CD16/CD14 plot (Figure 2A and 2D). However, both the NK cells and B cell populations overlapped with the non-classical monocyte population (Figure 2B and 2C). The steps of the gating strategy (Figure 1D and 1E) were confirmed to exclude the NK cells (Figure 3A) and B cells (Figure 3B). Although the B cell population included a small portion of non-classical monocytes, the amount was negligible. Having gated the subsets, the degree to which they expressed different surface markers, M1 (CD64, CD86, and CD120b) and M2 (CD163, CD11b, and CD93) was assessed. The markers showed positive expression compared to their corresponding isotype controls, as seen by the shift of the histograms (Figure 4). The median of the markers was greater than that of the isotype controls. Application of this gating strategy to a blood sample, which was split into four tubes, stained and analyzed separately, yields comparable results between tubes (Table 4). Figure 1: Representative monocyte gating strategy in whole human blood. (A) FSC(A) vs. FSC(H) plot: Gating the cells that have an equal area and height, thus removing clumps (greater FSC(A) relative to FSC(H)) and debris (very low FSC) K= 1000. (B) FSC(A) vs. SSC(A) plot: Broad selection of monocytes based on their SSC/FSC properties. (C) CD16 vs. CD14 plot: Gating to select monocytes based on their characteristic "┐" shape. 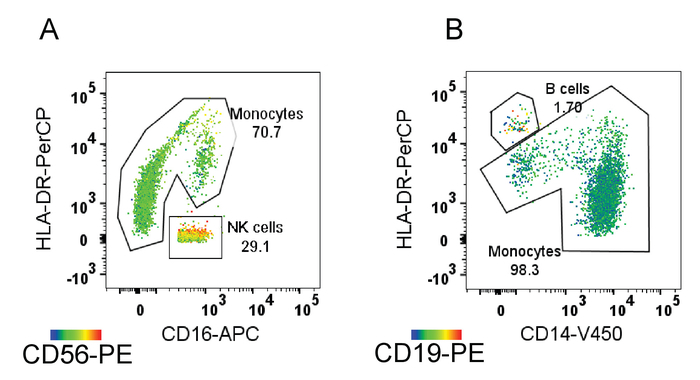 (D) CD16 vs. HLA-DR plot: Gating to select HLA-DR positive cells and remove NK cells. (E) CD14 vs. HLA-DR: Gating to exclude the B cells (HLA-DR high/CD14 low) from the monocytes. (F) Selected monocytes redisplayed on CD16 vs. CD14 plot to gate the monocyte subsets. For A-F color represents cell density with blue and green indicating low density, red and orange indicating high density, and orange indicating mid-range density. Please click here to view a larger version of this figure. Figure 2: Validation of gating strategy by identification of potentially contaminating cells. 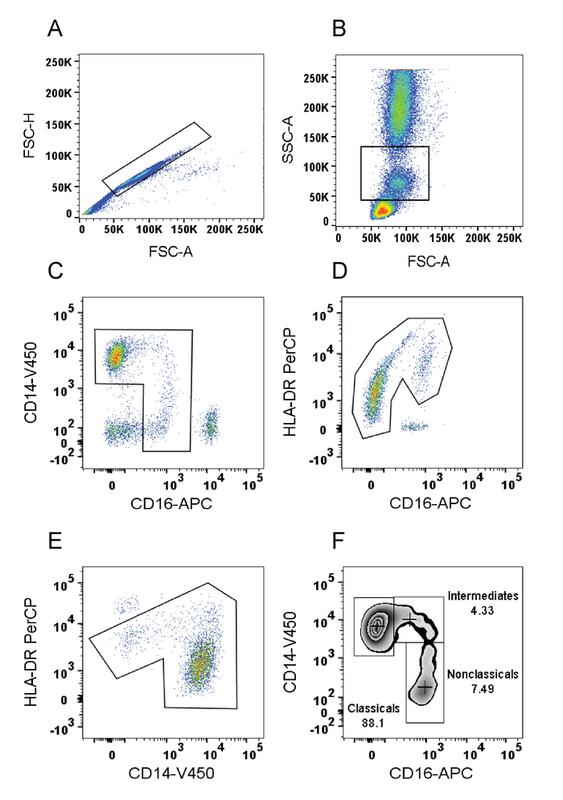 Potentially contaminating cells are identified by markers (A) T cells (CD3), (B) B cells (CD19), (C) NK cells (CD56), and (D) neutrophils (CD66b). The left side panels show identification of each population after gating as per Figure 1A and 1B, with color representing cell density from high (red) to low (blue). The right side panels show each cell population (blue) superimposed on the final monocyte CD16/CD14 plot to reveal proximity of these populations to monocytes (red). Please click here to view a larger version of this figure. Figure 3: Confirmation that gating steps remove contaminating cells. 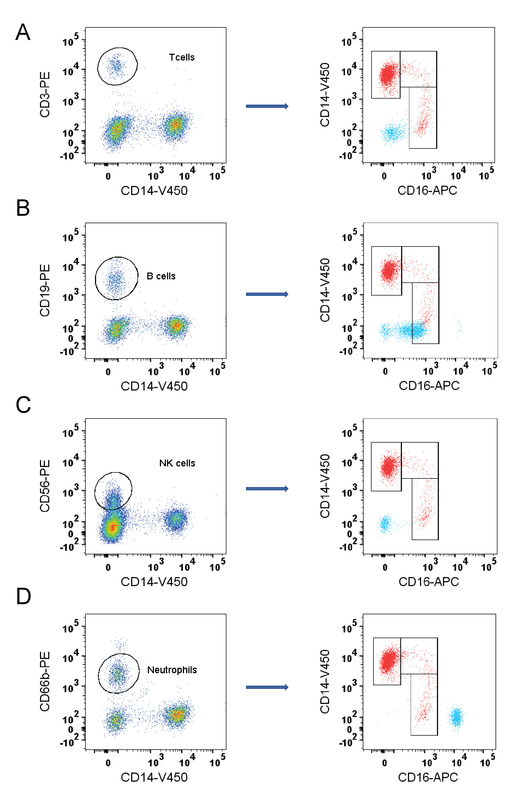 Heat maps showing the degree of expression from high (red) to low (blue) of (A) CD56 and (B) CD19. Gating steps successfully exclude cells with high CD56 (NK cells) and high CD19 (B cells). Please click here to view a larger version of this figure. Figure 4: Monocyte expression of M1 (CD120b) and M2 (CD93) markers. 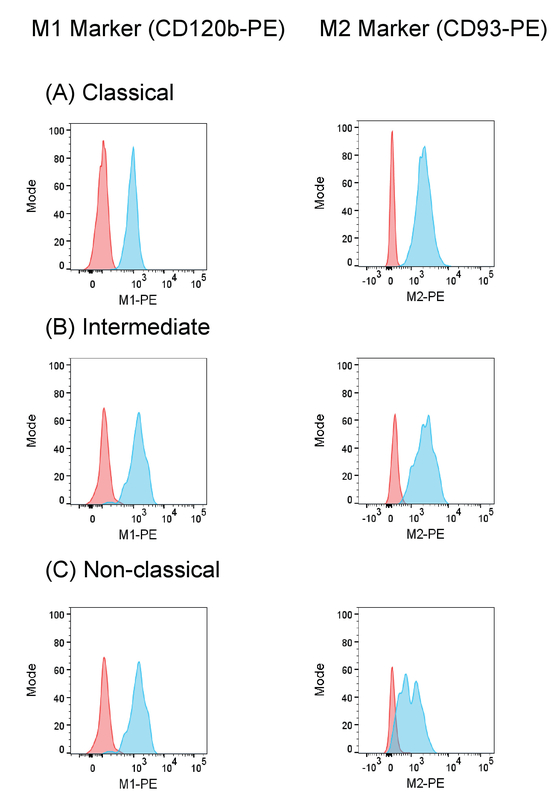 Smoothed histograms of monocyte M1 and M2 marker expression (blue) showing clear shift from the isotype (red) for (A) classicals, (B) intermediates, and (C) non-classicals. Please click here to view a larger version of this figure. Table 1: Antibodies for whole blood flow and master mix. Table 2: M1/M2-PE Fluorochrome labeled monoclonal antibodies for whole blood flow. Table 3: PE Fluorochrome labeled monoclonal antibodies for lymphocytes (T cells, B cells), neutrophils, and NK cells. Table 4: Monocyte subset proportions from one blood sample stained and analyzed separately. Whole blood flow cytometry is an ideal approach to study monocytes as the cells are examined in conditions close to their physiological microenvironment providing an insight into their roles in infection and inflammatory conditions. Furthermore, the use of fresh (i.e., unprocessed) blood samples minimizes the alterations or cell transformations that can occur due to storage or handling18,19, such as those known to occur with freeze-thawed monocytes20. Prompt sample preparation is recommended as some markers are upregulated if samples are kept at room temperature prior to processing19. The optimal concentrations of M1 and M2 markers were determined by titration, and this should be done for any new antibody to limit non-specific binding whilst ensuring that the degree of shift is due to antigen expression and not restricted by lack of antibody. The removal of red blood cells and fixation of white blood cells with lysis solution is an important step in this protocol as the presence of red blood cells can interfere with flow cytometry21,22. Note that while some lysis solutions are compatible with no-wash staining, clearer populations are evident in our hands when a wash step is used. Correct setup of the flow cytometer is also critical when comparing expression of monocyte markers. We recommend that researchers maintain consistent target fluorescence intensities of control beads and perform quality control on the instrument to be used to provide consistent results across different samples run on different days. In addition to this, isotype controls are used to assist in interpreting any non-specific background signal generated by non-specific antibody binding. Monocytes have high levels of Fc receptors11 and therefore are prone to non-specific binding. Of note, the level of non-specific binding differs for the different subsets, and thus the use of an isotype control becomes important when comparing the degree of marker expression between subsets. Another important criterion to be considered is the gating steps employed. Some studies suggest that it is crucial to draw a tight gate around the monocyte population in FSC(A)/SSC(A) plot to get rid of most of the non-monocytic CD16 positive cells23,24,25, but this may lead to loss of some monocytes as non-monocyte cells can overlap with monocytes on FSC/SSC plots26. Rather, to exclude any other blood cells that may contaminate the monocytes, the inclusion of a third monocyte marker in addition to CD14 and CD16, is essential26,27. For this reason, HLA-DR is often used and is ideal as it is not expressed by NK cells or neutrophils17,28. Although lymphocytes (B cells and T cells) may express HLA-DR, they differ from monocytes in respect to CD14 expression. While HLA-DR is an ideal third marker, CD86 has also been recommended5,27,29 but was not used here as it is also an M1 marker and thus its degree of expression on monocyte subsets was assessed. Validation of the gating strategy used is of crucial importance. While NK cells are known to overlap with non-classicals if they are not gated out28, we notice that B cells can also overlap with the non-classicals (Figure 2B); whether this is the case in other studies may depend on the fluorochrome choice, instrument configuration, detector sensitivity, or even the disease condition being examined. Here, the overlapping B cells showed high expression of HLA-DR and were not gated out by selection of HLA-DR positive cells in Figure 1D. Rather, to remove B cells we used an additional plot of CD14/ HLA-DR, where the B cells separate out from non-classicals due to their higher HLA-DR and low CD14 expression. There are also many different ways in which the gates for the monocytes themselves have been drawn in the literature; these include quadrants (the subsets are separated by quadrant markers), and rectangular or trapezoid boxes13 (with separate boxes drawn for each subset) which furthermore differ in their placement delineating where one subset ends and another starts. These differences likely reflect the fact that monocytes exist as a continuum of cells, differentiating from classical to non-classical, rather than as clearly distinct populations. However, because variations in techniques for identifying the subsets themselves can lead to differences in the calculated monocyte subset proportions, it becomes important that the gating method is reasonably objective, rather than subjective, as this will make the method more robust and reproducible. Some studies use an isotype control for CD16 to determine the border between the classical and intermediate subsets30. On the other hand, to define the separation between intermediates and non-classicals, it has been proposed that the cut-off line may be vertical or oblique, with the choice up to the investigators, the proviso being it should be reproducible, but a rectangular gate has been recommended to facilitate comparisons between studies13,30,31. Here, increased objectiveness was obtained by plotting the data on a zebra plot and applying objective visual rules, because zebra plots provide an additional visualization cue by mixing color gradient to each equal probability bin over a traditional contour plot. The right border of the classical subset was drawn such that the population was evenly distributed around the population median. The division between the intermediates and non-classicals were also standardized by having the base of the intermediates align with the bottom of the concentric circles within the classical population (i.e., the intermediate population clearly expresses high levels of CD14, as per the standard nomenclature1). While some studies have suggested the use of additional markers, such as C-C chemokine receptor type 2 (CCR2) or 6-sulfo LacNAc (SLAN) for obtaining successful enumeration of monocytes and to reveal their clinical significance32,33, in our hands the level of expression of many monocyte functional markers varies widely between individuals14. Such variation may limit the usefulness of these markers to define subsets based on their expression. Automated computational approaches have also been used to visualize and cluster monocyte subsets including visual interactive stochastic neighbor embedding (viSNE), t-distributed stochastic neighbor embedding (tSNE), or Spanning-tree Progression Analysis of Density-normalized Events (SPADE)34,35, which can provide visual representation of the cells based on the set of multiple markers used. While this has been shown to increase the accuracy of the gating strategy in monocyte subset classification, it is recognized that a drawback is the number of antibodies (and corresponding fluorophore channels) required. Its usefulness will depend on the questions being asked; the extra complexity may not be warranted, for example, in enumeration studies. Monocytes gated with our technique show proportions in line with the literature and the expression of surface markers by the three subsets can be readily determined. Overall, the technique and methodology explained here provides a standardized and straightforward method of enumerating monocyte subset proportions and assessing surface marker expression, which can be extended to include other markers as well, thereby validating their functional roles in various other conditions. Flow cytometry was performed in the Flow Cytometry Core Facility that is supported by the Westmead Institute for Medical Research, Westmead Research Hub, Cancer Institute New South Wales, and National Health and Medical Research Council. This study was supported by Clinical Chemistry Research and Education Fund. Ziegler-Heitbrock, L., et al. Nomenclature of monocytes and dendritic cells in blood. Blood. 116, (16), e74-e80 (2010). Rossol, M., Kraus, S., Pierer, M., Baerwald, C., Wagner, U. The CD14(bright) CD16+ monocyte subset is expanded in rheumatoid arthritis and promotes expansion of the Th17 cell population. Arthritis & Rheumatism. 64, (3), 671-677 (2012). Wildgruber, M., et al. The "Intermediate" CD14++CD16+ monocyte subset increases in severe peripheral artery disease in humans. Scientific Reports. 6, 39483 (2016). Heine, G. H., et al. Monocyte subpopulations and cardiovascular risk in chronic kidney disease. Nature Review Nephrology. 8, (6), 362-369 (2012). Rogacev, K. S., et al. CD14++CD16+ monocytes independently predict cardiovascular events: a cohort study of 951 patients referred for elective coronary angiography. Journal of the American College of Cardiology. 60, (16), 1512-1520 (2012). Bories, G., et al. Impaired alternative macrophage differentiation of peripheral blood mononuclear cells from obese subjects. Diabetes and Vascular Disease Research. 9, (3), 189-195 (2012). Fadini, G. P., et al. An unbalanced monocyte polarisation in peripheral blood and bone marrow of patients with type 2 diabetes has an impact on microangiopathy. Diabetologia. 56, (8), 1856-1866 (2013). Satoh, N., et al. Unbalanced M1/M2 phenotype of peripheral blood monocytes in obese diabetic patients: effect of pioglitazone. Diabetes Care. 33, (1), 7 (2010). Chen, X., Devaraj, S. Monocytes from metabolic syndrome subjects exhibit a proinflammatory M1 phenotype. Metabolic Syndrome and Related Disorders. 12, (7), 362-366 (2014). Williams, H., et al. Human classical monocytes display unbalanced M1/M2 phenotype with increased atherosclerotic risk and presence of disease. International Angiology. 36, (2), 145-155 (2017). Wong, K. L., et al. Gene expression profiling reveals the defining features of the classical, intermediate, and nonclassical human monocyte subsets. Blood. 118, (5), e16-e31 (2011). Hijdra, D., Vorselaars, A. D., Grutters, J. C., Claessen, A. M., Rijkers, G. T. Phenotypic characterization of human intermediate monocytes. Frontiers in Immunology. 4, 339 (2013). Zawada, A. M., et al. Comparison of two different strategies for human monocyte subsets gating within the large-scale prospective CARE FOR HOMe Study. Cytometry Part A. 87, (8), 750-758 (2015). Patel, V. K., Williams, H., Li, S. C. H., Fletcher, J. P., Medbury, H. J. Monocyte inflammatory profile is specific for individuals and associated with altered blood lipid levels. Atherosclerosis. 263, 15-23 (2017). Bayer, J., Grunwald, D., Lambert, C., Mayol, J. F., Maynadie, M. Thematic workshop on fluorescence compensation settings in multicolor flow cytometry. Cytometry Part B: Clinical Cytometry. 72, (1), 8-13 (2007). Szaloki, G., Goda, K. Compensation in multicolor flow cytometry. Cytometry Part A. 87, (11), 982-985 (2015). Abeles, R. D., et al. CD14, CD16 and HLA-DR reliably identifies human monocytes and their subsets in the context of pathologically reduced HLA-DR expression by CD14(hi) /CD16(neg) monocytes: Expansion of CD14(hi) /CD16(pos) and contraction of CD14(lo) /CD16(pos) monocytes in acute liver failure. Cytometry Part A. 81, (10), 823-834 (2012). Mukherjee, R., et al. Non-Classical monocytes display inflammatory features: Validation in Sepsis and Systemic Lupus Erythematous. Scientific Reports. 5, 13886 (2015). Lundahl, J., Halldén, G., Hallgren, M., Sköld, C. M., Hed, J. Altered expression of CD11b/CD18 and CD62L on human monocytes after cell preparation procedures. Journal of Immunological Methods. 180, (1), 93-100 (1995). Appleby, L. J., et al. Sources of heterogeneity in human monocyte subsets. Immunology Letters. 152, (1), 32-41 (2013). Dagur, P. K., McCoy, J. P., et al. Collection, Storage, and Preparation of Human Blood Cells. Current protocols in cytometry. Robinson, J. P. 73, 5.1.1-5.1.16 (2015). Einwallner, E., et al. Lysis matters: Red cell lysis with FACS Lyse affects the flow cytometric enumeration of circulating leukemic blasts. Journal of Immunological Methods. 390, (1), 127-132 (2013). Tsujioka, H., et al. Impact of Heterogeneity of Human Peripheral Blood Monocyte Subsets on Myocardial Salvage in Patients With Primary Acute Myocardial Infarction. Journal of the American College of Cardiology. 54, (2), 130-138 (2009). Autissier, P., Soulas, C., Burdo, T. H., Williams, K. C. Immunophenotyping of lymphocyte, monocyte and dendritic cell subsets in normal rhesus macaques by 12-color flow cytometry: Clarification on DC heterogeneity. Journal of Immunological Methods. 360, (1), 119-128 (2010). Hristov, M., Schmitz, S., Nauwelaers, F., Weber, C. A flow cytometric protocol for enumeration of endothelial progenitor cells and monocyte subsets in human blood. Journal of Immunological Methods. 381, (1-2), 9-13 (2012). Zawada, A. M., et al. Monocyte heterogeneity in human cardiovascular disease. Immunobiology. 217, (12), 1273-1284 (2012). Zawada, A. M., et al. SuperSAGE evidence for CD14++CD16+ monocytes as a third monocyte subset. Blood. 118, (12), e50-e61 (2011). Heimbeck, I., et al. Standardized single-platform assay for human monocyte subpopulations: Lower CD14+CD16++ monocytes in females. Cytometry Part A. 77, (9), 823-830 (2010). Rogacev, K. S., et al. Monocyte heterogeneity in obesity and subclinical atherosclerosis. European Heart Journal. 31, (3), 369-376 (2010). Ziegler-Heitbrock, L., Hofer, T. P. J. Toward a Refined Definition of Monocyte Subsets. Frontiers in Immunology. 4, 23 (2013). Weber, C., et al. Role and analysis of monocyte subsets in cardiovascular disease. Joint consensus document of the European Society of Cardiology (ESC) Working Groups "Atherosclerosis & Vascular Biology" and "Thrombosis". Thromb Haemost. 116, (4), 626-637 (2016). Shantsila, E., et al. Immunophenotypic characterization of human monocyte subsets: possible implications for cardiovascular disease pathophysiology. Journal of Thrombosis and Haemostasis. 9, (5), 1056-1066 (2011). Hofer, T. P., et al. slan-defined subsets of CD16-positive monocytes: impact of granulomatous inflammation and M-CSF receptor mutation. Blood. 126, (24), 2601-2610 (2015). Qiu, P., et al. Extracting a cellular hierarchy from high-dimensional cytometry data with SPADE. Nature Biotechnology. 29, 886 (2011). Thomas, G. D., et al. Human Blood Monocyte Subsets: A New Gating Strategy Defined Using Cell Surface Markers Identified by Mass Cytometry. Arteriosclerosis, Thrombosis, and Vascular Biology. 37, (8), 1548-1558 (2017).